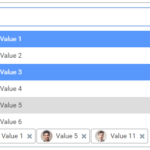 Supports both single and multiple selection. Adds custom descriptions to options. 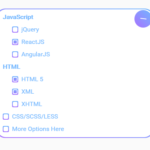 Allows you to move the selected options to another element. Initialize the tail.select on an existing select box. Config the tail.select by passing the options object as the second parameter to the select function. // pins selected options on the top of the dropdown list. // set the display: none styling, to the source select element. Add: The new Itlaian Translation. Add: The new Norwegish Translation. Add: The new experimental linguisticRules options, which allows to regex letters, which are (used) similiar. Update: [ES6] Changed the last var variables into let. Add: Allow callback functions as strings to allow a deeper translation. Add: The new internal method _e, which handles the translations. Info: It isn’t longer possible to get an option using the internal option number! Remove: The internal-Array storage has been completely removed. Bugfix: The .remove() method on the options hasn’t worked on the internal-Array storage. Bugfix: The ECMAScript 6 Version returns an Array, while the default version does not. Bugfix: TypeError: Cannot convert undefined or null to object. Bugfix: Remove default options sorting. Add: The new Brazilian Portuguese Translation. Add: The new searchDisabled option, which allows to exclude disabled options on the search. Update: The .finder() method depends now on the .find() method. Bugfix: Wrong Version Number on the main object. Bugfix: Options floats over the dropdown field. Bugfix: Search functionality hangs exponentially when regular expression matches against larger source options. Add: The new modify() method on the string Storage to change the strings globally. Update: The .register() method checks now if locale is a string and object a object. Update: The .register() method returns now true on success and false on failure! Bugfix: ES6 The “Select All” Button doesn’t work on Search (All options gets selected). Bugfix: Z-Index CSS Styling bug (:hover). Bugfix: Unnecessary Scrollbar (during a wrong calculation of the dropdown field). Bugfix: “Select All” Button selects more items as shown on search results. 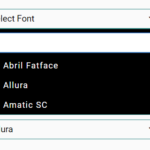 Bugfix: Search functionality breaks when source select’s options contain hyphenated attributes. Add: A custom event listener which allows more details / arguments. Add: The new on() method to use the new custom event listener. Add: The new config() method to get and set configurations after init. Add: The new setCSVInput() method to handle the CSV Input field. Add: The new internal trigger() method which handles the events. Add: The new default createGroup() and createItem() callback methods. Add: The new cbLoopItem and cbLoopGroup options, which allows to use a custom callback function for the creation of options and groups within the dropdown list. 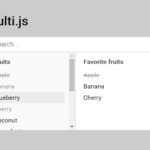 Add: The new multiSelectAll and multiSelectGroup options, which allows to (un)select all options or all options within a group! Add: The new walker() function which replaces walk(). 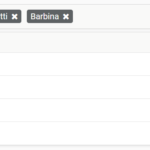 Add: The additional class name in-search on search-results. Update: The jQuery and MooTools Bindings. Update: The init() method on tailOptions uses now also set(). Update: The reload() method uses the same instance instead of creating a new one. Update: The open(), close() and toggle() method accepts now one parameter, which disables | the animation (if turned on). Update: The Group will also be shown on search-results. Update: New strings including a new string-key structure (+ updated translations). Update: Assign HTML String method instead of Single Element Creation on init(). Update: The default option for height has been changed to 350 (px) according to the new maxHeight JS-based setup (replaces the CSS setup). Update: The sort callback on the walker() method is now called directly instead as callback within the sort() function! Update: The CSS design has been modified and adapted to the new features. Rename: The internval variable tailSelect.instances has been renamed into tailSelect.inst. Bugfix: The items option object doesn’t added a option description. 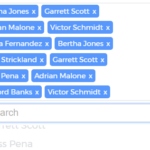 Bugfix: Don’t close the dropdown list, when playing with the multiContainer element. Bugfix: Already selected items can be selected again! Bugfix: Load Items into the multiContainer and csvInput field on soft reloads. Deprecated: The walk() function has been marked as deprecated and gets removed in the future! Hotfix: Mismatching / Faulty Search Regex on different HTML conditions. Update: Change for loop expression. Codacy: ‘ev’ is already defined. (no-redeclare). Codacy: ‘ev’ used outside of binding context. (block-scoped-var). Add: The options csvOutput and csvSeparator as well as a hidden CSV input method. Add: Support as Asynchronous Module Definition, tested with requireJS (I’m new with AMD). Update: The animate option is now set to true per default! Update: Correct use of the labels / placeholders.